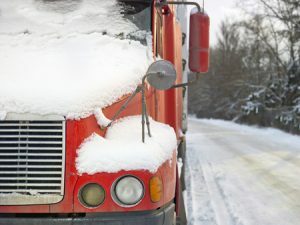 Here's How Truck Drivers Can Overcome the Challenges of Winter's Most Frigid Months | Platinum Drivers Inc.
Winter is probably the most challenging of seasons for truck drivers because of cold, snowy and icy weather. It can be hard to be “on-time” and juggle “hours-of-service” limitations when Old Man Winter brings a snowstorm your way, that’s for sure! In the winter, how does a trucker deal with bad weather? Well, it’s all about planning and patience. There are certain times when road conditions are better– like after they’ve been plowed, right? So a truck driver has to literally plan “around” the weather conditions. It wouldn’t make sense to drive through a snowstorm where you can’t see ten feet in front of your rig due to whiteout conditions. But after a storm dies down and moves out of the area, and the streets/highways have been plowed, then it’s time to truck on. Some young truckers want to see what they can get away with when it comes to their speed in bad driving conditions. However, road speeds have to be slower when the pavement is wet or icy. Even if you think, “Well, whatever’s underneath won’t bother me,” Mother Nature has a way of teaching fools lessons. Basically, when the roads are slick, that means putting more space between you and all the vehicles around you. It means easing into a stop rather than slamming on the brakes. It also means waiting around at a truck stop until conditions are better on the roads, even if you’re wishing you were driving and making money. “Safety first” should be a truck driver’s mantra each winter. He or she needs to make safety a priority– for their own sake, their cargo’s sake, and for the sake of people and vehicles around them. Winter weather driving requires drivers to be flexible with their plans, their timing and their routes. It’s not unusual to have to utilize alternate routes when roads are “bad” in the winter. Truckers always need to watch out for snow drifts and other road hazards. During winter, listen to the radio for road advisories. Watch for message signs. Follow directions of both road crews and law enforcement officers. If there are flashing lights ahead, slow down and proceed with caution. Winter driving requires truck drivers to be patient planners putting safety as their first priority. Whether you’re looking for quality, temporary drivers or you’re a truck driver looking for work, Platinum Drivers is here to help. ← What Makes a Truck Driving Candidate Qualified?